Above: Cecilia Parker in a publicity still for the MGM film A Family Affair (1937). The average film buff is likely to remember Cecilia Parker chiefly as one of the leading members of the “Hardy Family,” in Metro-Goldwyn-Mayer’s long-running movie series of that name–but, to the serial buff, her name first brings to mind her several appearances in the chapterplays of the 1930s. Slender, blonde, and beautiful, with the ability to appear sweetly calm and thoughtful one moment and endearingly enthusiastic and impetuous the next, she brought plenty of spark and charm to the serial genre before her cliffhanging career was cut short by her move to MGM. Cecilia Parker was born in Fort William, Ontario, Canada; her family relocated to England not long after her birth, following her father’s enlistment in the Canadian Army’s medical corps and his transfer overseas to serve in the first World War. Her father was discharged in 1920, and moved his family first back to Ontario, and then (circa 1923) to California–specifically, the Hollywood area. Cecilia had begun studying music during the second Canadian phase of her childhood, and continued to do so after the move to Hollywood; upon completing high school, she set out to earn money for her musical studies by working as a movie extra. However, her career path changed in 1932, when Fox executives plucked her from the extras’ ranks and gave her a screen test that resulted in her co-starring with George O’Brien in a pair of generously-budgeted Fox Westerns, The Rainbow Trail and Mystery Ranch. Though Fox showed no further interest in Parker, she decided to stay in the acting business, and started to freelance in Hollywood; with two prominent roles for Fox–one of Hollywood’s “Big Five” studios–on her resume, she was easily able to land leading roles at other, smaller studios. One of the first of these smaller studios to hire Cecilia was Universal, which in 1932 cast her as the heroine in their serial The Jungle Mystery. Based on a novel by Talbot Mundy, Jungle Mystery centered around a priceless cache of ivory hidden somewhere in the African wilds–into which Parker’s character, Barbara Morgan, ventured (along with her father) to find her brother, who’d vanished while seeking the ivory. Barbara and her father (William Desmond) were forced to contend with the villainous Shillow (Philo McCullough), whose gang was also hunting for the ivory, but were aided by the heroic Kirk Montgomery (Tom Tyler) and his pal Fred Oakes (Noah Beery Jr.). While Jungle Mystery exists complete in Universal’s vaults, it has not been seen by either the general public or collectors since its original release, making it impossible for me to add any additional details about Parker’s inaugural serial–other than to say that its strong cast, exotic setting, and the apparent prominence it gave to Cecilia are all strong reasons to hope that it someday becomes generally available. 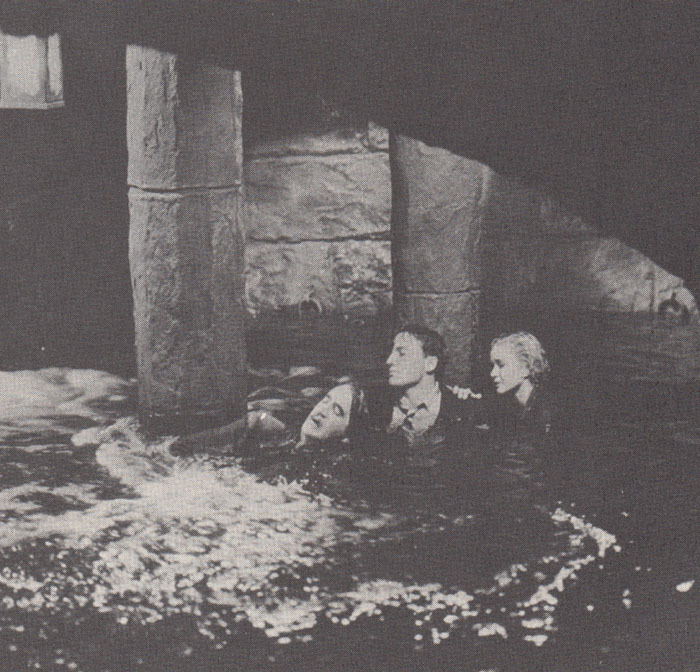 Above, left to right: Cecilia Parker, Noah Beery Jr., Carmelita Geraghty, and Tom Tyler in The Jungle Mystery (Universal, 1932). 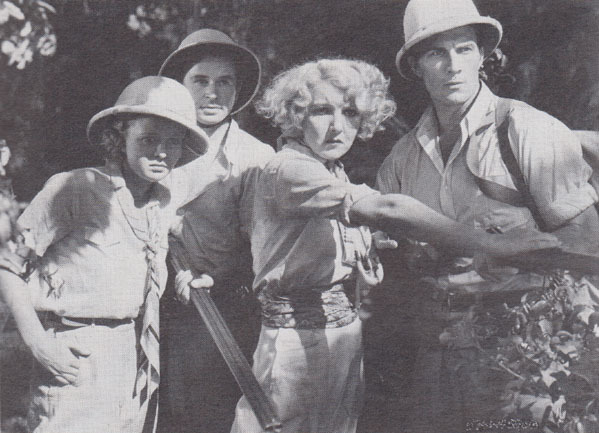 Above: Sam Baker menaces Cecilia Parker in Jungle Mystery, but Tom Tyler (swinging his rifle), Noah Beery Jr. (aiming his rifle), and Frank Lackteen are about to come to the rescue. Immediately upon finishing The Jungle Mystery, Parker was cast as the heroine in a second Universal chapterplay, The Lost Special (1932). Very freely adapted from a short story by Sir Arthur Conan Doyle, Special was a lively and enjoyable sleuthing saga in which a mine-owner’s son and a young aspiring reporter joined forces to track down thieves who’d stolen and hidden the “special” of the title–a train carrying a shipment of gold. 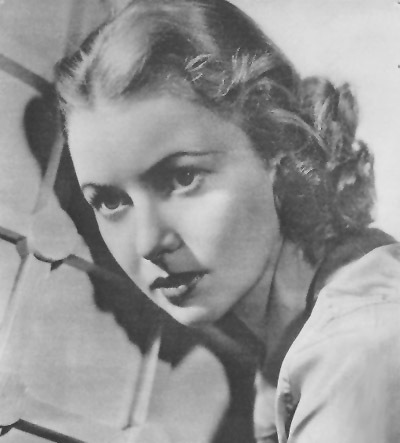 Betty Moore, the aforementioned young reporter, was played by Cecilia, who managed to make her character seem both journalistically astute and youthfully careless–gravely and determinedly examining clues, but cheerfully and eagerly rushing into dangerous situations without stopping to consider risks. Her irrepressible sprightliness perfectly complemented that of her equally brash and breezy leading man, Frank Albertson, played entertainingly off the more low-key and cautious demeanor of her sidekick Caryl Lincoln, and helped overall to make Lost Special’s scenes of character interaction just as memorable and entertaining as its action scenes. Above: The exasperated Caryl Lincoln and the enthusiastic Cecilia Parker wait for things to start happening in The Lost Special (Universal, 1932). 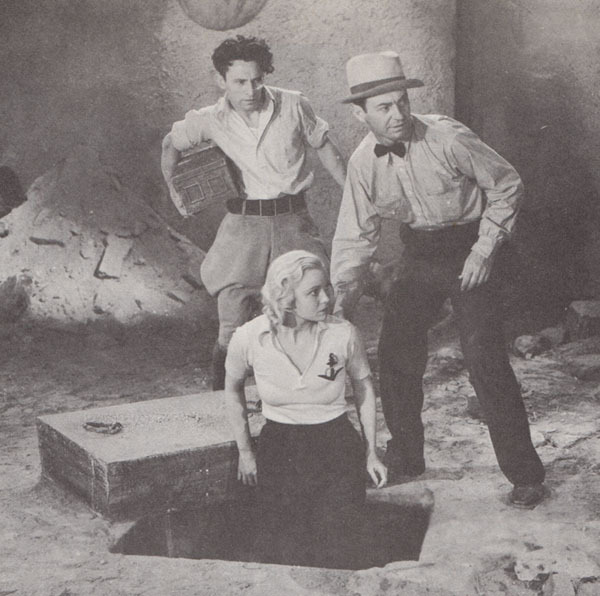 Above: Francis Ford (far left), Frank Albertson, and Cecilia Parker are trapped in a flooding cellar in The Lost Special. From late 1932 to mid-1934, Parker devoted most of her acting time to co-starring in B-westerns for Columbia, Universal, and assorted independent producers, playing opposite cowboy heroes that included Ken Maynard, Buck Jones, and John Wayne; during this period, she also appeared in a few non-Western B-films, a couple of comedy shorts–and her third and final serial, Mascot Pictures’ 1934 release The Lost Jungle. This colorful chapterplay starred famed lion-tamer Clyde Beatty, who–playing himself–was wrecked on an uncharted island that contained a wide assortment of wild animals, a lost city with a hidden treasure, and a gang of mutinous sailors bent on acquiring the aforesaid treasure. Cecilia was cast as Ruth Robinson, the daughter of the captain overthrown by the mutineers; she and her father quickly joined forces with Beatty and his sidekick Larry Henderson (Syd Saylor) in order to deal with the animal and human dangers of the island. Parker played her part in Jungle with a fine combination of concern and cheerfulness–making Ruth seem properly worried about the precarious position in which she and her father were placed, but also maintaining an appealingly chipper and adventurous demeanor as she helped Beatty explore the island and battle its menaces. Her well-modulated performance also made a good counterbalance to both the low-key acting of the inexperienced Beatty and the broad boisterousness of veteran comic Saylor. 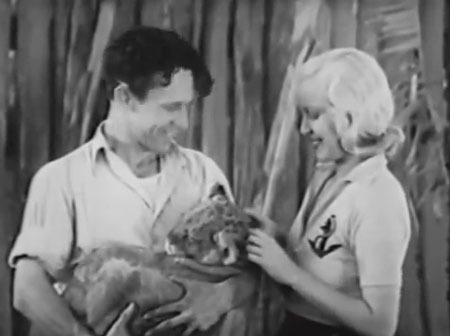 Above: Clyde Beatty, Cecilia Parker, and a lion cub called Nero in The Lost Jungle (Mascot, 1934). Above: Clyde Beatty, Syd Saylor, and Cecilia Parker flee the ruined city of Kamor in The Lost Jungle, with an off-screen gorilla in pursuit. Later in 1934, Parker was signed to a contract by the prestigious MGM, where her first screen assignment was a small but noticeable role as Greta Garbo’s sister in The Painted Veil; she would make her first big mark at MGM the following year, with a major role in Ah, Wilderness. The success of the latter film encouraged MGM to produce several other features that teamed Cecilia with Wilderness leading man Eric Linden; from 1935 to 1937 she divided her time between these starring vehicles, supporting roles in other MGM films, and loan-out assignments at other studios ranging from Chesterfield to RKO. It was A Family Affair, one of her MGM films with Linden, that had the greatest impact on her career; it proved such a big hit that MGM launched an entire series of comedy-dramas about its leading characters, a small-town judge named Hardy and his family. This series would prove a popular and remarkably long-running one, and Parker–as the Judge’s daughter Marion–remained a prominent part of it all the way through 1942, although she was gradually reduced from co-star to supporting player as the films began to focus more and more on the character of young Andy Hardy (Mickey Rooney–who, incidentally, had played a small part in Lost Jungle). Though the Hardy pictures claimed most of her attention during the late 1930s and early 1940s, Parker did a handful of other MGM films during those years, and also appeared in one PRC movie opposite her husband Robert Baldwin, whom she’d married in 1938. In 1942 she retired from the screen to raise her children; except for a reprisal of her Marion Hardy role in the 1958 film Andy Hardy Comes Home, she would make no more movie appearances. She and her husband resided for many years in Ventura, California, where Baldwin ran a real-estate business; they were still living there when Cecilia passed away in 1993. Though Cecilia Parker made fewer serials than most of the other great serial queens of the 1930s, her beauty and her sparkling personality still earn her a place among the decade’s best chapterplay heroines. She reacted to thuggish threats, vehicular crashes, animal attacks, and many other standard serial hazards with appropriate and convincing seriousness–but never allowed such perils, no matter how frightening, to submerge her delightful vivacity for very long. 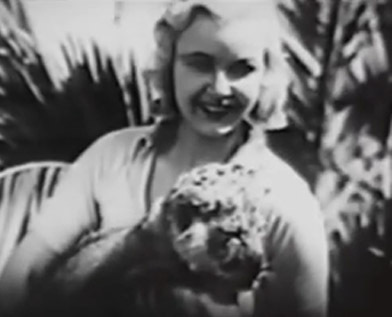 Above: A beaming Cecilia Parker poses with “Nero,” in the still used to introduce her character at the beginning of each chapter of The Lost Jungle (Mascot, 1934). Acknowledgements: Cliff Aliperti’s excellent and comprehensive article on Cecilia Parker’s life and career at his fine Immortal Ephemera website provided me with most of the biographical information in this article; the info about Robert Baldwin’s realty business came from “frankfob2’s” capsule biography of Parker at the Internet Movie Database.